How Far is JKB Royal Garden? JKB Housing presents you Royal Garden is represents everything contemporary, Architecture that is unassuming yet grand, a habitat of 10 good quality apartments built for your happy living. 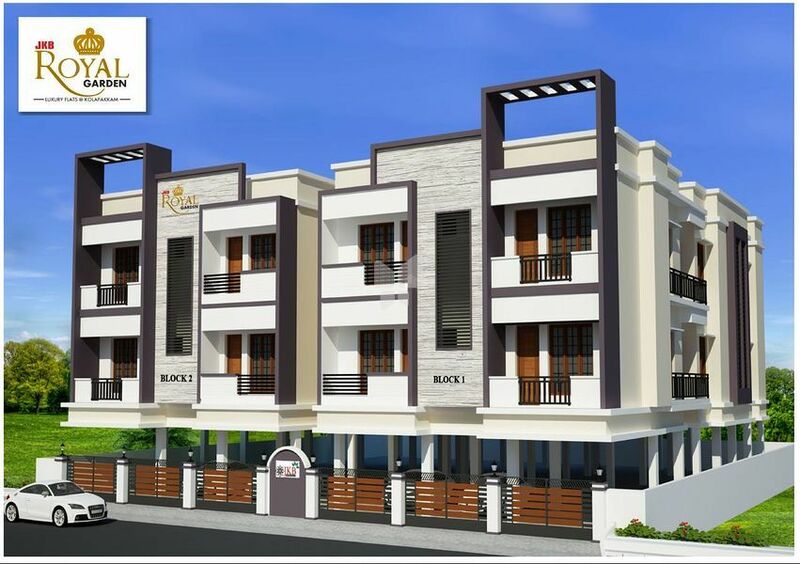 Located at Maxworth Nagar, Kolapakkam, is very close to essential amenity like Park, Bus stops, Schools, Banks, Supermarket, Park etc to ensure your comfortable living. With Ground Floor and two more floor. 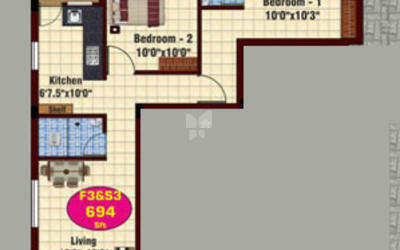 The spacious 2 bhk apartments, has floor areafrom 848 sqftto 1113 sqft. Reinforced Cement Concrete framed structure. 9 inch Brick work for outer walls and 4.5 inch thick brick work for internal partition walls. Inner walls plastering with cement mortar 1:3 ratio, All ceiling plastering area will be rough finish with C.M.1:4 ratio. Wooden Frame with PVC Door. Good Quality White Saal frame with teakwood shutters with glazing and M.S.Grills. Window Glass is Swestic design. "L" shape kitchen slab with Polished Granite top (black). Stainless Steel sink size 24x18 (Prince brand-703 / MAVELI) will be provided (without drain board) . One Aqua guard Provision will provided in kitchen. Main Doors to have a Godrej Lock - 1, 6” Brass Tower Bolt 1, 8” Brass Tower Bolt -1, Main Door Handle 1, Inner 6” Brass Handle 1, Lens – 1, Door Chain – 1, Door Magnet – 1 (or) Door Stopper – 1, 5” Brass hinges – 3. Sakthi Lock with handle 1, 5” Powder coating Hinges – 3, 6” tower bolt powder coating - 1, 8” tower bolt powder coating - 1, Door stopper – 1, 2.5” Bush – 1. 4” power coating Hinges -2, 4” Powder coating tower bolt – 2, Handle – 1, 5” Ukku – 1. All fittings will be Hindware Brand. One Indian Water Closet of Orissa pan size 21x17 (Hindware-Model: 20004) in common toilet (White colour only) without flushing tank & One Wash Basin size 18"x14" (or) 17”x12” (Hindware-Model : Winsor 10036 (or) Parryware C0489 Tapti model) White Colour Only. EWC (OASIS model -81x43x70cms–) at toilet in Bedroom with high level flush tank (White colour only) One Wash Basin size 18"x14" (Hindware-Model : Winsor 10036 (or) Parryware C0489 Tapti model) White Colour Only. Dining area wash basin and semi pedestal size 22"x18" (Hindware-Model: STUDIO) White Colour Only. Two coats of JK wall care putty with primer one coat with two coats of Asian Paints Tractor Emulsion for inner walls. Bore well of 6" dia (or) Open Well with over head tank with Submersible Pump set. R.C.C Sump will be provided with 12000 Ltrs capacity with Pump set. Loft : Bedroom one loft will be provided, Kitchen one side loft will be provided. Kitchen Cupboard : 4*7 with 1' projection. 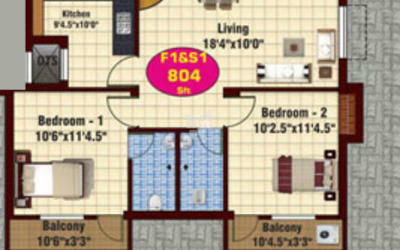 Wardrobe : Each bedroom 4*7 with cuddapah slab partition 1.6' projection. Each Bedroom 1 side loft another side Extra. Ceiling putty finish will be extra. Main Door if its panel door (Wooden). Living area & any other area putty work will be extra. All Cornish Design Living area & any other area will be extra. Kitchen Fan Point will be extra. In 3 bedroom flats, any 2 bedroom A/c point will be provided, another bedroom A/c point will be extra. Kitchen top granite rib work is extra. Kitchen, Bedroom Wardrobe wood work will be extra. Pooja Shelf will be extra. Shoe Rack will be extra. S.S. handrail for staircase area. Car parking area Paver Block “I” model Provided. JKB Housing was started in 2002 with the primary goal of providing unmatched customer service in the field of property development and management. Our unique approach to business ensures your satisfaction in all your interactions with us. Our vision is to build a organization that is able to offer every customer complete satisfaction through our professional and high quality work. Distinguished for ideal locations, functional designs, superior quality, timely delivery and exceptional customer care, renowned for ethical dealings and honest pricing, JKB Housing remains as the most trusted home makers of Chennai. At JKB housing is where happiness, comfort, peace of mind and luxury resides. For location, design, finishes and services JKB Housing is unmatchable. Homes that carry a signature of our long standing commitment to excellence in delivering superior value has earned us the trust, confidence and respect of home seekers.